Available as a medium sized print approx 12" x 10" mounted in cream board. 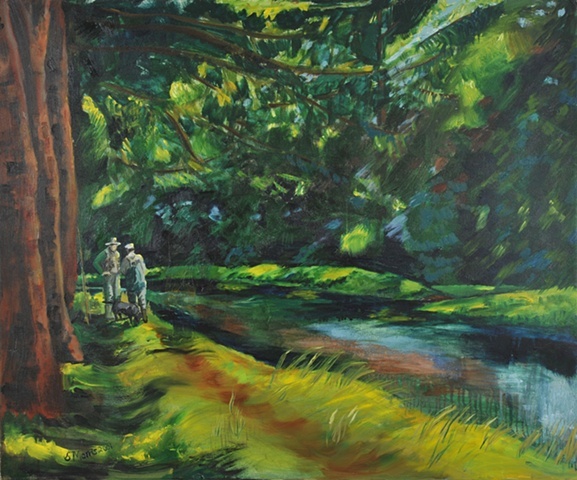 Toad's Hole on the River Tweed at Dryburgh, Oil on Canvas, 36" x 30" Gold framed £1, 350. My brother William, the ghillie George and Purdie the lab were taking a break with their rods leaning against the Scots Pine. Light was filtering through the trees and my sketchbook was in my hand.... a year later I completed my canvas of this moment.